Her name is Miss Bojangles. She's a very nice pig. A pot-bellied pig. And I am giving her a ride to a rescue farm so that she can have a nice home near the town of Zachary, Louisiana. Zachary is a cheerful community north of Baton Rouge and it is home to a surprising variety of animal rescue peeps. The pig will get to play with other small farm animals previously belonging to city folks who didn't quite think things through when somebody said, "Daddy, can I have a pig?" 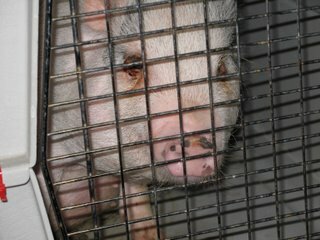 The pig's presence was pointed out to me at a truck stop, where I had paused to put diesel in the Volkswagen. 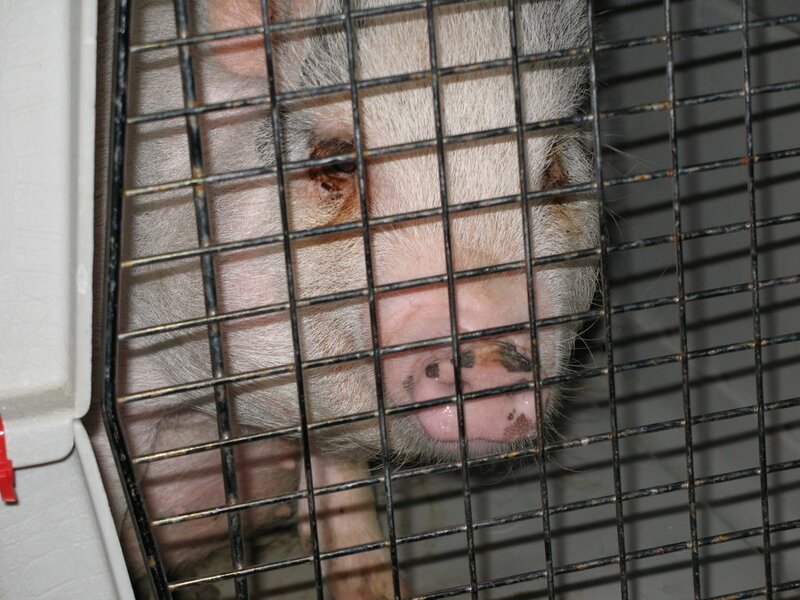 "Hey, you have a pig in your car," announced a helpful young man, in case I hadn't noticed. I considered for a moment that this lad's keen powers of observation must be quite helpful in his career, until I realized that his career appeared to be "Hanging Around At The Truck Stop While Drinking Malt Liquor Wrapped In A Paper Bag." "So it seems." I nodded amiably in his direction and continued pumping. "What kind of pig is it?" the young man continued. "It's a potbellied pig," said I. He considered this information for a moment. "Are they good?" he asks. "Yes, they're very nice animals." He stared at me for a minute and said, "No, I mean ... do they taste good?" I laughed. "No, he's not for dinner ... he's going to live on a farm"
"Oh." He nods enthusiastically and takes a big slug of malt liquor. "He's not so big yet. Gotta fatten him up. Makes sense." Satisfied that all is right with the world of swine, the young man turns and waddles off to the other end of the truck stop building -- the end where the mini-casino is housed. I get back in the car and drive off. The pig grunts happily in her kennel. In addition to the pig, I have another pink thing in the Volkswagen. Actually a mauve thing. 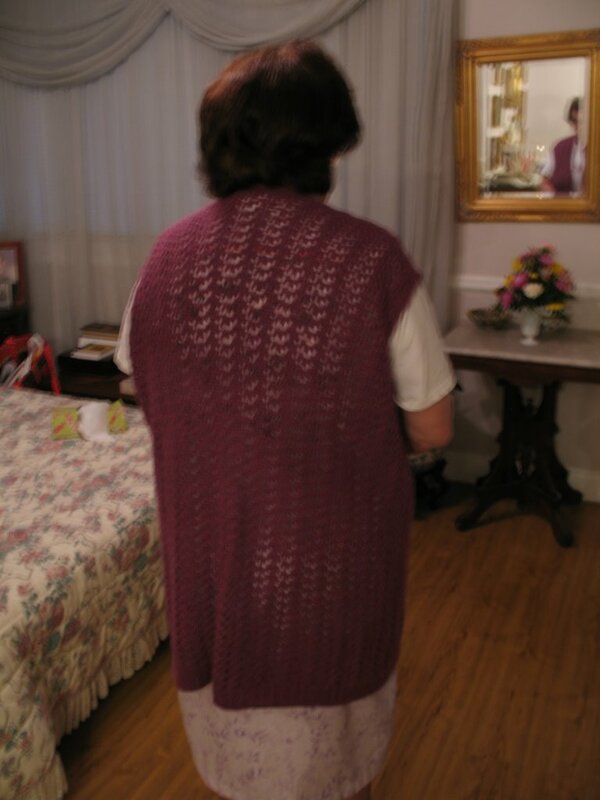 It is the lace alpaca vest for my mother, finished and blocked, just in time for spring, which means that she gets to admire it, fuss over it, try it on and then put it away until fall. I hope to suprise Mom at Christmas with a matching accessory made from the two extra skeins of matching Inca Alpaca I have left over. Mom, dont read that last line. I want you to be surprised next Christmas, okay? On my way for Mom to have a try-on. Ah, yes, Dez. Now if you could just have a little talk with my co-worker whose daughter really, really, really wants a rabbit (that he plans to keep outdoors in a hutch in Pennsylvania. . .). If they had brains, they'd be rocket surgeons, no? "a pig in a Volk (swagon.)" Hope Miss Bojangles enjoys her new home. I do believe this is my favorite blog entry title, possibly of all time. My most recent efforts, in a burst of creativity, were Random Musings and More Random Musings. Of course, I don't own a Volkswagen and my closest encounters with pigs come in the form of bacon. Love reading your blog; I wish you had more time to do it. (I'm sure you do, too!) Thanks!